How were children of the medieval and renaissance times dressed? How can you adapt period clothing to be worn by modern kids? How do you make the clothes last as long as possible? How do you not spend a fortune? I’ll do my best to answer these and other questions in this class. First to introduce myself – I’ve been sewing costumes nearly my whole life. I have been making children’s costumes since my stepson was small – both for Halloween and for Renaissance faires. My twins were born in 2000, and have been subjected to wearing elaborate costumes since they were tiny. They’ve worn costumes to Bristol since they were about two years old, and have increased their garb stash by several orders of magnitude since we joined the SCA in 2006. They have some costumes that have lasted two, three or even four years, with some simple alterations. Hopefully I can provide some insight in to what to make and how to make it to help you clothe your own children. So, the first question is: How were children of the medieval and renaissance times dressed? The answer is – it depended on their age and class. Infants were typically swaddled until they were nearly a year old due to the belief that this would help their limbs grow straight. Unknown artist of the British School, "Cholmondeley Ladies", c. 1600; Tate Collection. Slightly older children might wear smocks and simple dresses to give them some freedom of movement. Hans Holbein the Younger, "The Artist's Family", 1528; Kunstmuseum, Öffentliche Kunstsammlung, Basel. Gerard David, "Triptych of Jan Des Trompes", 1505; Groeninge Museum, Bruges. Boys as well as girls wore skirts until they were about five years old. At the point that a boy changed to wearing breeches or slops, he was said to be “breeched”. The portrait to the left shows Lady Katherine Grey and her son Edward Seymour, aged one or two years. The portrait to the right shows Charles Stuart, still in skirts. He was born in 1555, so if this portrait is correctly dated at 1563, he would have been eight years old. His older brother Henry Stuart, Lord Darnley, is ten years older and is wearing slops. Unknown artist, "Lady Katherine Grey and her son", 1562. 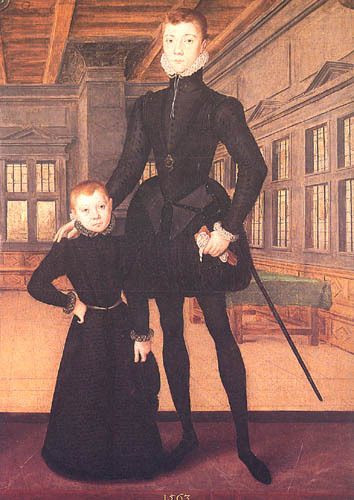 Hans Eworth, "Henry Stuart and his brother Charles", 1563. Boys in portraits were often differentiated by the fact that they wore a sash or carried a sword. The portrait on the left is a detail of Barbara Gamage and her children shows one boy, who hasn’t been breeched, wearing both a sash and a sword, in contrast to his younger sisters. On the right is a portrait of Ann, Lady Pope with her children shows three children of varying ages. The oldest boy carries a sword, while the younger boy carries a bow and arrow. The middle child is clearly a girl – dressed like her mother. Marcus Gheeraerts the younger, "Barbara Gamage with Six Children", 1596; Penhurst Place. Marcus Gheeraerts the Younger, "Anne, Lady Pope with her children", 1596; National Portrait Gallery, London. Class station also had a large impact on how a child was dressed. If a child’s parents’ were laborers wearing simple clothing so they could do a hard day’s work, then the child was likely to be simply dressed as well. There are few paintings that show lower classes, since these individuals could not afford to pay for a portrait to be made. There are, however, some paintings showing country scenes that contain both adults and children. This first detail from a painting of a peasant dance shows a girl in a simple kirtle, with an apron and coif. In the second image, a drawing of a peasant family, the boy seems to be dressed quite similarly to his father, with a houpelande, hose and hat. Peter Brueghel the Elder, "The Peasant Dance", 1567; Kunsthistorisches Museum, Vienna, Austria. Unknown artist - French, "Armorial de Revel", 1456; Bibliotheque nationale de France. A child from a higher class family was likely to be dressed very similarly to his or her parents. However, their clothing was likely to have a few concessions to comfort and growth. These girls' dresses may look quite confining to modern standards, but the loosely gathered skirt and roomy sleeves would probably be relatively comfortable compared to her mother’s gown. Isaac Oliver, "Two Little Girls", 1590; Victoria & Albert Museum. Alonso Sanchez Coello, "Infanta Isabella Clara Eugenia of Spain and her younger sister Infanta Catalina Micaela of Spain", 1571; Museo del Prado, Madrid. In these family portraits, the youngest children seem to wear clothing that is considerably simpler in style than their older siblings. In each case, the youngest child’s clothing is white or off-white, decorated with only simple trim. The older children wear clothing that has considerably more decoration and more separate pieces that must be worn. Unknown artist, "Portrait of the De Moucheron family", 1563; Rijksmuseum Amsterdam. These portraits also show some details that are common in children’s portraits of the time. In the left-hand portrait, the boy has a bird on his hand. Favorite animals and pets are often incorporated into the family portrait, as with the dog held by the boy to the right. Sofonisba Anguissola, "Three Children with Dog", 1570-1590. Rattles are often held by babies, or held for them by their mothers. Dolls occur in several portraits. Red coral necklaces are seen quite frequently, as red coral was believed to protect children from harm. Anonymous - Netherlandish, "A Little Girl with a Basket of Cherries", 1570s Photo © The National Gallery, London. How do you adapt period clothing to be worn by modern kids? There are several different tips and factors to consider when putting together garb for your child. Where is he or she going to wear it? I love the fancy court garb that my children will actually wear on occasion, but it’s impractical for most events. My young twins and my stepson all do youth combat and archery, so they need comfortable clothes that they can move in. We often go to weekend or even week-long camping events, including Pennsic. The vast majority of the time we are there, my kids are in simple linen garb. What styles should you make and what tricks can you use for simplicity? This again has much to do with how active your children are. The basic garments of a t-tunic and trews (pants) are a good place to start. Making the tunic large and long through the body will provide room for growth, and you can also belt it. Trews can be made from a modern pajama-style pant pattern. This style of pant is generally quite roomy, and by leaving a wide hem you can lengthen them as your child grows. If you’re ready for more complicated garb, you can move onto kirtles for girls and cotes for boys. I highly recommend the book “the medieval tailor’s assistant” by Sarah Thursfield. This book provides guidance on how to make common garments such as shirts and smocks, kirtles and cotes. It will walk you through taking measurements and making a body block, which is a base pattern that fits the body. From there, if you are looking for late period garb, you can move to the doublet for boys and bodice with skirts for girls. A doublet can be drafted using a basic shirt pattern. You just need the basic body shape with the shaped armholes. Or, you can draft your own pattern using the directions in my handout on “Drafting a Child’s Bodice or Doublet Pattern”. I have “cheated” the look in several ways. On the blue doublet shown to the right, the shirt is faked. I made a small collar, which I permanently attached to the doublet, and sleeves, which are sewn into the armholes. This makes it easier for a small child to stay neat – fewer layers which need to stay tucked in and in place. To go with the black and burgundy doublet on the right, I was in a hurry and didn’t have time to make a new shirt. I purchased a white dress shirt at Walmart and cut the foldover collar off, leaving a standup collar. I purchased boxpleat trim at Hobby Lobby and sewed it over the remaining collar and cuffs. Instant small ruffs! The slops in the blue outfit are somewhat time consuming, but the Venetians like the ones with the black and burgundy doublet are easy to make. You can tie the doublet and Venetians/slops together with points (strings or ribbons). This was done in period – you can see the ties in some portraits. It again keeps everything together, although it can cause a little problem if they need to separate them in the bathroom in a hurry. For girls, a bodice can be made similarly by simply taking the basic shape including armholes from a shirt or vest pattern, or from drafting your own using the instructions in the handout. The closure can be in front or back. I often put it in the back since I will be dressing her anyway, and it leaves less for her to fuss with in the front. The skirt can be permanently attached to the bodice, which again minimizes the fussing that is required to keep the pieces in place. The black and burgundy outfit used this trick, as well as a faked smock. I created a smock from the waist up, and attached it to the inside waist of the dress. This way, the whole dress could be put on in one piece and the pieces did not move in relation to each other. There are a few more tricks you can use to make your child’s garb more comfortable, easier to get in and out of, and easily adjustable. Use elastic in waistbands and gathered cuffs. It may not have been used in period, but it makes things a lot easier in modern times. Use Velcro for openings such as the fly on a pair of venetians or slops, so that boys can easily undo them to use the bathroom. You can even put faux buttons on the front of the doublet and have it fasten with Velcro. I have recently started to use Velcro along the edges of my daughter’s Elizabethan overskirts and foreparts to keep everything together. It works so well, I’m tempted to put it on my own gowns. How do you make the clothes last as long as possible? The answer is to incorporate room for growth. My kids tend to grow up rather than out. I made this black and burgundy outfit for my daughter in 2005. I made the bodice somewhat wider through the body than she needed and left a wide hem. I was later able to let down the hem and eventually add another black guard along the bottom. The bodice still fit nicely. The second photo was taken in 2008 – three years after the dress was first made. I used a similar approach for a dress made for a friend’s daughter. It was first made for her when she was about ten months old. The body was made slightly large so she wouldn’t fuss at it being tight and to give room for growth. Since she wasn’t walking, hemming it slightly long didn’t matter. A year later, the same dress was now mid-calf level, perfect for an active toddler so she didn’t trip over the skirt. One concern about having a large hem that gets folded up inside the dress or pants is that the folded part gets stepped on and generally messed up, sometimes more than the outside edge. One solution that I’ve tried is to start by making the dress significantly longer than it needs to be. Then cut off the excess at the length you want the dress currently, keeping the extension to be added back on later. Use the skirt fabric or a contrasting fabric to wrap the bottom edge of the dress to protect it. When the extra length is needed in the future, remove the protective strip and sew the extension back on. Apply a strip of matching or contrasting fabric or ribbon to cover the seam, and hem the dress to its new length. A concern with this method is that the extension would have less wear than the rest of the dress. Washing it with the dress each time would minimize the difference in fading. Another tip is to leave extra fabric in the seam allowances, so that the seams can be taken out and resewn later to make the outfit larger. The downside of this approach is that the fabric that was in the seam allowance to start with may not be as worn looking as the rest of the garment. Then when you let the seams out, you will have strips of new-looking fabric along each seam. This may be more or less of an issue depending on the fabric you select and whether you bind the seams with a technique such as a serger. All fabric for kids’ clothing should be washable. Wash it in hot water and dry it in the dryer before you begin cutting the pattern. This will ensure that shrinkage occurs before the garment is made, not after. How do you not spend a fortune? You definitely want to use fabrics that wash easily and last a long time. I prefer linen, because it was definitely used in period, has many weights and colors, and breathes easily. Linen can be bought online for about $7-8 per yard. Linen/cotton blends and linen/rayon blends are often less expensive than 100% linen. If linen is too costly, cotton can certainly be substituted. One of the problems with cotton, however, is finding a weave that is the right weight. Basic broadcloth is often used for garb, but I find it too thin so that it doesn’t hang correctly. I sometimes use a medium weight cotton twill, especially for more structured clothing such as bodices and doublets. It wears quite well and is machine washable. A fabric called weaver’s cloth is slightly heavier than broadcloth, and has a rough weave that looks somewhat like linen. Cotton velveteen and cotton/polyester home decorating fabrics are other good options. These may say they should be dry cleaned, but I generally wash them anyway. The texture may change slightly, but it has never been enough to bother me. Stay away from 100% synthetic fabrics such as polyester, nylon, etc. These are not breathable, making them less comfortable in warm weather. They may not be washable, either. Trim is often the most expensive part of a late-period garment, so keeping trim simple can also help. Instead of purchasing cording, use strips of fabric over thick yarn to create your own edging. For applied trim, use strips of contrasting fabric or use solid ribbon, which can be purchased by the spool rather than by the yard. Waiting for sales at local fabric stores can help keep the cost down. Search the clearance racks for fabrics that would work for period garb. At the end of the season, linen in colors that weren’t popular can be had for a steal. Sign up for coupons through the mail and via e-mail. Discounts are there if you keep your eyes open. Good luck with your costuming adventures! Look at portraits, look at the details of other garb you see at events, ask questions. You are only limited by your imagination. I hope your children enjoy their new garb! Barjavel Designs Linen, linen cotton. Denver Fabrics Lots of apparel and home decorating fabric. fabrics-store.com Huge selection of weights and colors of linen, linen/cotton. M&J Trim Trim, ribbon, buttons. Renaissance Fabrics Wool, silk, linen, trim. Butterick 5656 (discontinued) Could be used for basic shape of doublet. Skip long skirting. Add Venetians. Includes cape and hat patterns. Boys sizes 2-8. McCall’s 5207 Purely fantasy/princess. There are better options. Girls sizes 3-6 or 7-14. McCall’s 5214 Could be used for basic shape of doublet. Skip darts and long skirting. Lengthen and shape lower front edge, add short skirting or tabs. Does not include pants. Includes tabard pattern. Kids sizes 3-8. McCall’s 5499 Not a bad starting point for medieval garb. Uses princess seams, which were not used in period. Ideally, combine pieces when cutting to avoid curved side-front seams. Kids sizes 3-8. McCall’s 5500 Basic shape that could be modified into doublet, but no pants included. Kids sizes 3-8. Simplicity 2817 Snow White pattern could be used for basic bodice shape and skirt. Skip cape and high collar. Puffed upper sleeve is OK, but should be attached to a lower sleeve. Do not use a zipper. Girls sizes 3-6 or 7-14. Simplicity 3644 < /span>Includes vest, which could be modified into a doublet. Includes a nice shirt and short pants. Kids sizes 7-14. Simplicity 4494 < /span>(discontinued) Not very useful for SCA garb. It’s mostly fantasy styling. Pirate coat OK for fun. Kids sizes 3-8. Simplicity 5517 (discontinued) Great pattern for toddler garb. Includes many shortcuts such as making the shirt and bodice all one piece. Toddler sizes 6mo – 4T. Simplicity 5520 Not very useful for SCA garb. It’s mostly fantasy styling. Kids sizes 3-8. Simplicity 9384 (discontinued) Snow White pattern could be used for basic bodice shape and skirt. Skip cape and high collar. Puffed upper sleeve is OK, but should be attached to a lower sleeve, which could be taken from the Cinderella pattern. Do not use a zipper. Sizes 3-8. Simplicity 9836 ;(discontinued) OK pattern for older girls using bodice style. Nice smock – use long sleeve version. Needs overskirt – don’t just leave smock showing. Construction of burgundian (view C) is poor. Girls sizes 7-14.